Here is a great Montessori inspired activity that my preschool class has been enjoying lately to practice identifying and spelling names. 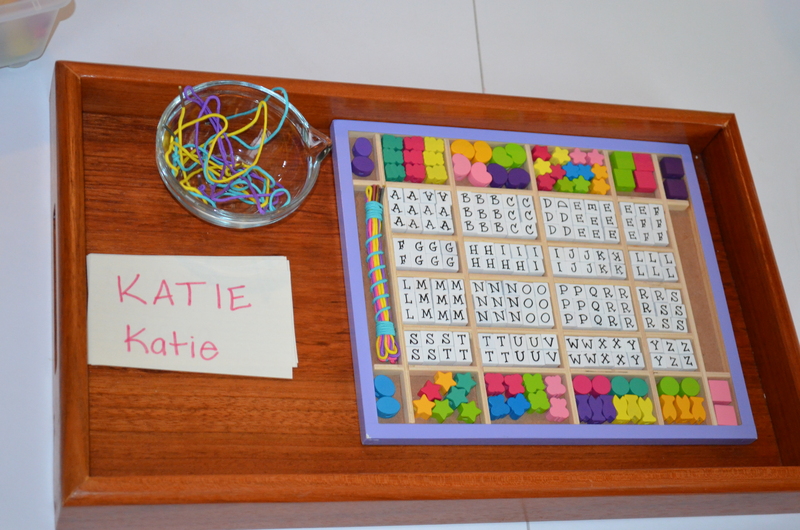 We try to do lots of fine motor activities, so I thought this would be a fun way to combine letter recognition. While my preschool is not an official Montessori, I certainly try to incorporate Montessori techniques into our learning on a daily basis. 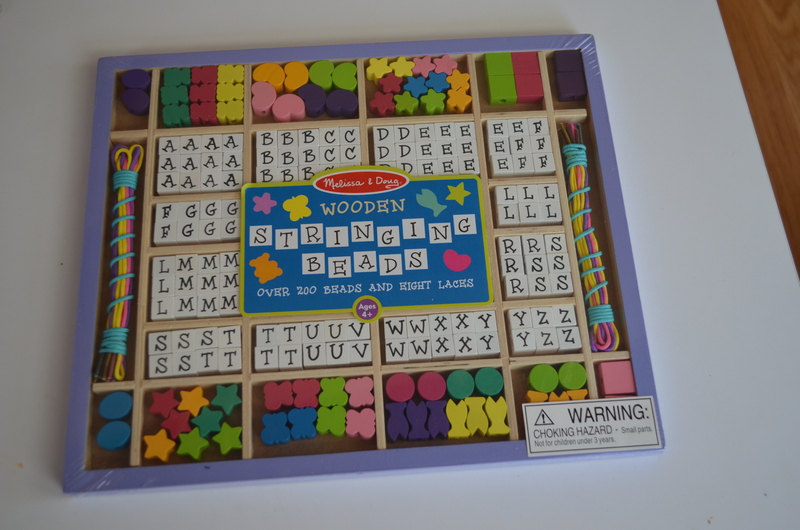 This wooden lacing kit is made by Melissa and Doug, and I found that it simplified my prep time. Any sort of letter beads could be used instead though. It was important to me to be able to separate the letters out, so that the correct ones could be easily found. This definitely achieved that purpose, and there were several to choose from. 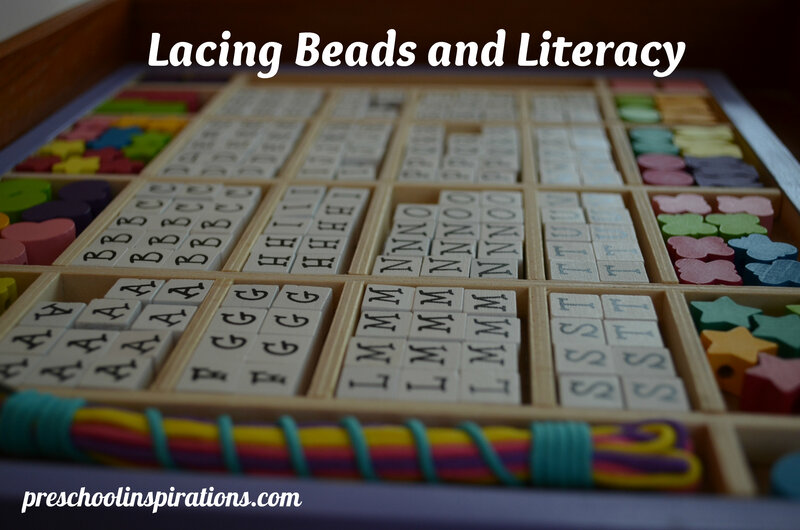 I also realized that some children would need close supervision with so many lacing beads, yet others could let me know when (or if) they would need my assistance. First, I went through all the children in the class and wrote their names for them. While I traditionally only try to use a capital letter and the rest lower case, I felt that I needed to put their name in all upper case letters as well since that is what these specific letters are. Then I showed them how to find the letter in the box that matched the letter on their name card. I laced my entire name through with their help, then it was their turn. I let them find their own names (and helped if needed) to help with name recognition, they then chose whichever lace they wanted. The very proficient four years olds completed this task well, but the younger ones were allowed extra freedom and flexibility. They mostly focused on finding some letters in their name or even letters that they liked. My philosophy is that as long as they are engaged and enjoy what I am working with them on, that’s more important than whether they are doing it exactly right. 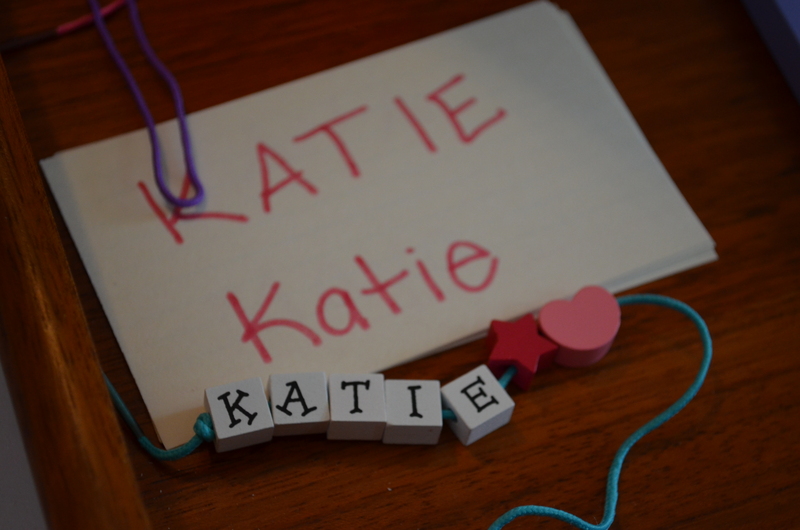 Great activity, Katie! I like that you showed the name with both upper- and lower-case letters along with the upper-case version. I pinned your post and featured it on the Living Montessori Now Facebook page. I’m thrilled you stopped by Deb! Thank you so much for the feature. I appreciate all that you do for parents, teachers, and the children who are blessed by them :). I love this idea but have a question. Do you let the students take the necklaces home after they complete the project? My students have such a hard time not taking the beads home. I never thought of writing their names out in all capital letters so it is easier to find. Thanks for the comment Nona. Since this is an ongoing activity, we keep all the materials here. I definitely respect when a child is extremely proud of his or her hard work, so I usually offer to take a picture of the item as a substitute for taking it home. So far, this has always been a happily accepted solution. I hope you get to try it out! Pinned! Featuring this at Family Fun Friday! Thank you so much Monica! I can’t wait to stop by and see all the great posts. You always have such a big turnout with some creative and delicious features :).